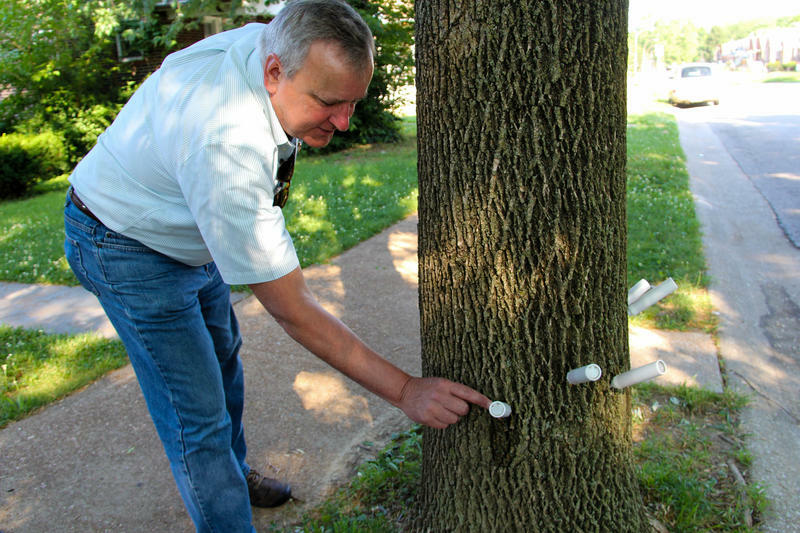 Forestry Commissioner Skip Kincaid points out the insecticide injections given to a tree in north St. Louis. On a residential street in the Central West End neighborhood, a worker wearing a hard hat and a safety vest used a chainsaw to cut the branches off of an ash tree. The tree and the ones next to it were marked for removal because the emerald ash borer, an invasive species, has come to St. Louis. The Asian beetle has decimated ash trees across the country since the early 2000s, particularly in the Midwest and the Northeast. In recent years, the emerald ash borer has spread to 28 counties in Missouri, most recently to Franklin County. Local authorities first detected the pest in the St. Louis in April 2015, in north St. Louis. This summer, the city’s forestry division began unrolling its $2.5 million strategy to combat the pest over five years. St. Louis Public Radio's Eli Chen explains the city's strategy to combat the invasive emerald ash borer. Nearly one out of five trees along city streets are ash trees, making it the most common tree species in the city. The city’s plan involves cutting down about 13,000 ash trees on public property. A tree being removed due to the emerald ash borer. Kincaid said the change to some neighborhoods will be dramatic, but streets will be in worse shape if nothing is done. 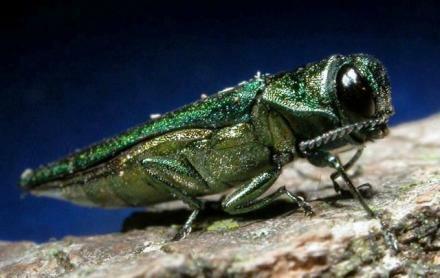 Once emerald ash borers have taken over an ash tree, the tree will certainly die within three years. An adult borer will lay eggs on the bark, which will hatch larvae. The larvae burrow into the tree and feast on the tissues necessary to transport water and nutrients to branches and leaves. However, the city will use chemical treatments to try save about 1,000 of its healthiest ash trees. But for that to work, crews must treat a tree before an emerald ash borer infests it. An ash tree receiving treatment from the city's forestry division. The effort recently got underway in north St. Louis, where a forester drilled small holes near the base of an ash tree. He drilled that low to reach the tree’s xylem — a system of tissues that push nutrients into the rest of the tree. Then, he injected crayon-shaped tubes containing an organic insecticide into the holes. “It’s like getting a shot in the arm or getting hooked up to an IV,” Kincaid said. The emerald ash borer will forge a D-shaped hole in a tree. But often, it’s difficult to see such holes since they are made toward the top of the tree. Kincaid said looking at the canopy helps determine how healthy a tree is. If 30 percent of the canopy or more is dead, the tree can’t be helped, he said. Officials also have performed cost analyses on city trees to justify the funds spent on treating them. That can be about $80 per tree, depending on its size. 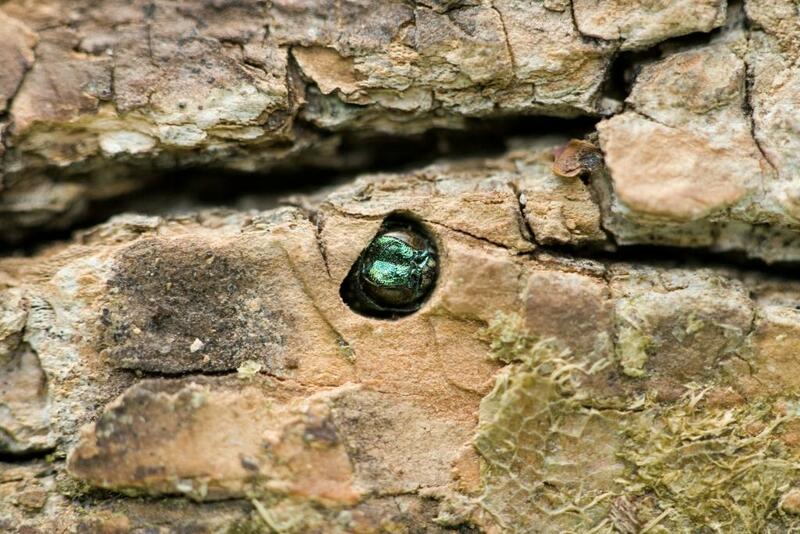 The white, caterpillar-like larva of the emerald ash borer digs a D-shaped hole into an ash tree's trunk, later emerging as the bright green adult beetle. The treatments have to be given every two years. 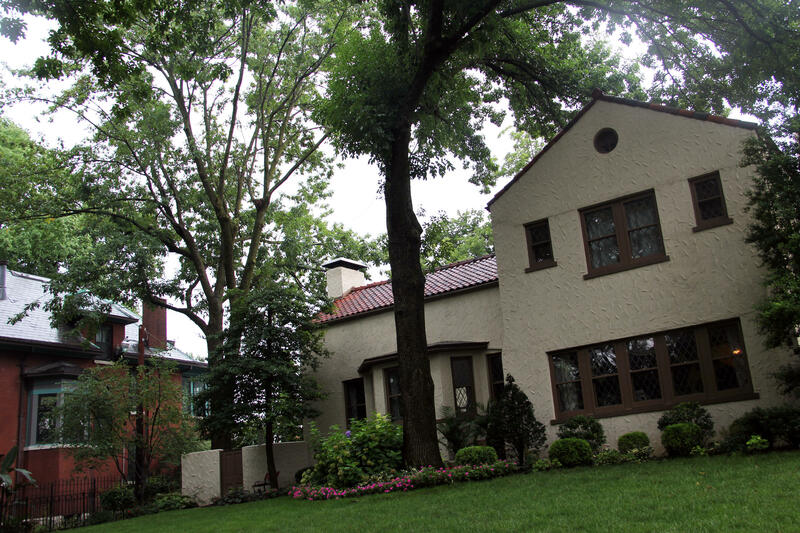 While the city implement its plan on its own trees, there are many more ash trees in St. Louis that exist on private property. The Bellefountaine Cemetery along the city’s northern border has taken steps against the emerald ash borer for the past four years. Kyle Cheesborough, the cemetery’s horticulture supervisor, said that it’s very likely the beetle has been in the area for several years once it’s been found. The parasitic wasps used to kill emerald ash borer larvae on an ash tree in the Bellefontaine Cemetery. Like the city, the Bellefontaine Cemetery has removed ash trees and injected some with pesticides. As a further preventative measure, the cemetery also conducts releases of parasitic wasps, which can destroy emerald ash borer eggs before they hatch. “The parasite actually lives out its entire life cycle inside the little tiny egg and then it emerges, also killing the egg,” Cheesborough said. 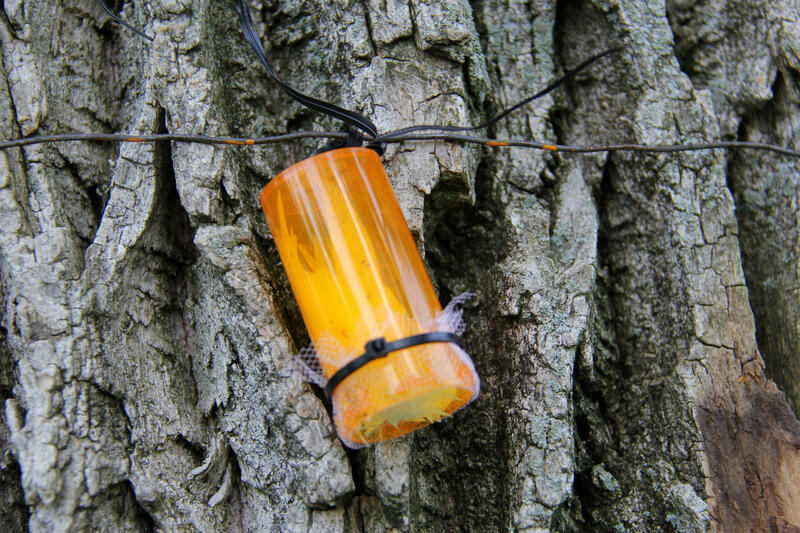 The wasps, provided by the Missouri Department of Agriculture, are placed in orange pill cases that are strung around the lower part of the tree and hung from the canopy. Cheesborough’s job requires him to be knowledgeable about how to take care of the trees in the cemetery. It bothers him that public awareness about the emerald ash borer is so low. “One of the things that frustrates me is that no one’s really doing a very good job of educating the homeowner. And, unfortunately, homeowners retain a large population of ash trees,” he said. In the Compton Heights neighborhood, where there is a large concentration of ash trees, resident Ron Chunn dreads the idea of seeing them disappear. The tall trees are ash trees on Compton Heights resident Ron Chunn's yard. “On this street, there’s 52 ash trees and some are over a hundred years old,” Chunn said. Chunn has five massive ash trees on his property. “If they’re all gone, we don’t have the same property,” he said. Chunn began having his trees treated about two years ago. 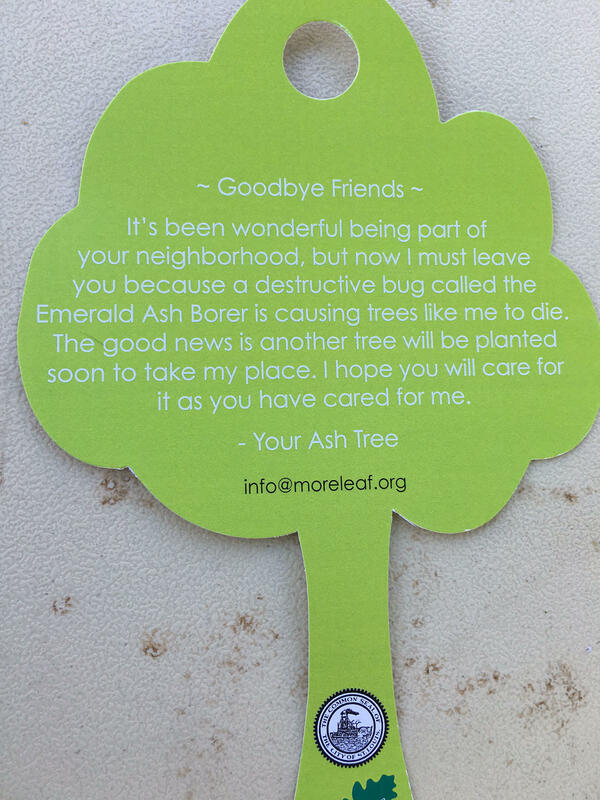 His arborist, Tom Beshoar of Davey Tree Service, urged him to take action because of the emerald ash borer. The work was expensive, but Chunn decided it was worth the investment. However, he wishes that more of his neighbors were aware of the invasive beetle. The city’s plan is to replace ash trees in six wards by next spring. The forestry division will pick from a list of 40 species and none of them will include ash trees. A sign made by the city and the Forest ReLeaf of Missouri, which is handling efforts to replace the removed ash trees. This month, St. Louis foresters will start chopping down about 13,000 ash trees on public property to stay ahead of the invasive emerald ash borer, a destructive pest that drains the life out of ash trees. Nearly one out of five trees on city streets are ash trees. 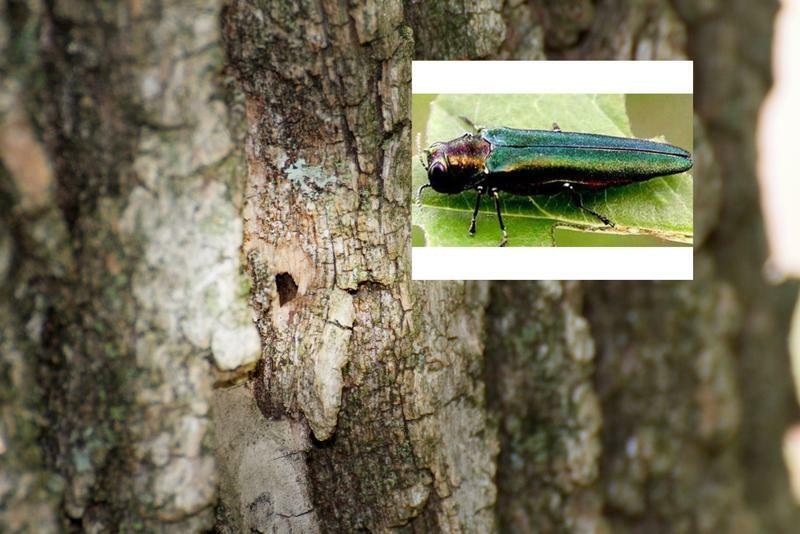 City Forestry Commissioner Skip Kincaid doesn’t deny that some residents may find the change startling, but the damage the emerald ash borer has caused to other cities across the country is no small matter. 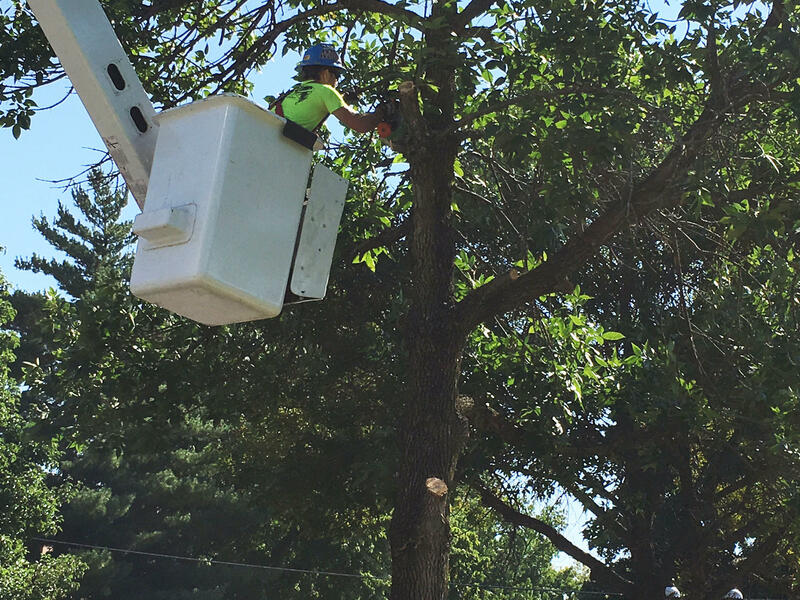 Residents of St. Louis may have come across an odd sight in their front yards this summer: workers drilling holes into trees and plugging up the holes with mysterious white tubes. The workers are urban foresters from the city of St. Louis' forestry division. While the activity might seem suspicious, they're trying to help ash trees that are vulnerable to the invasive emerald ash borer. An insect pest that has decimated ash trees in 25 U.S. states has now spread to St. Louis County. If left alone, the emerald ash borer will eventually kill any tree it attacks. The destructive green beetle was first detected in our area last year, in St. Charles County, and was found in north St. Louis City this past spring. In mid-August, it was confirmed in Creve Coeur.